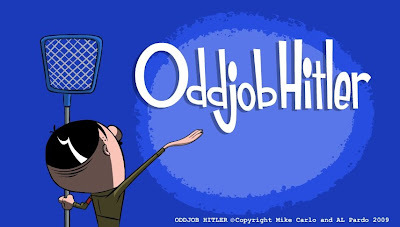 How do you start off a blog post when the title is something as absurd as Odd Job Hitler!? I'll do my best. Al and myself finally came together to make a cartoon. It's short as hell, but we're making it into a web series so there will be followup episodes coming within the next few months. One of which will further elaborate on how Odd Job came to be doing just that... Odd Jobs.I know I can speak for the both of us when I say we had an awesome time making this, we worked super hard to get it to look the way we wanted, and best of all we didn't fight each other at any point when it came to decisions or suggestions. It was a great example for us of what can be achieved with a small team (2 People). The cartoon although short and simple, was animated in flash by hand, using a traditional method of animation. Both Al and myself animated, designed, cleaned up, and storyboard-ed it ourselves. Let's give a shout out to Matt Lee who recorded me doing ridiculous voices for this thing, as well as helping us get the website up, and to my neighbor Matt Radman who never reads this blog, but who also helped us get this website up a great deal. Thanks guys, please go to the website, check it out and enjoy.Let us know what you think!